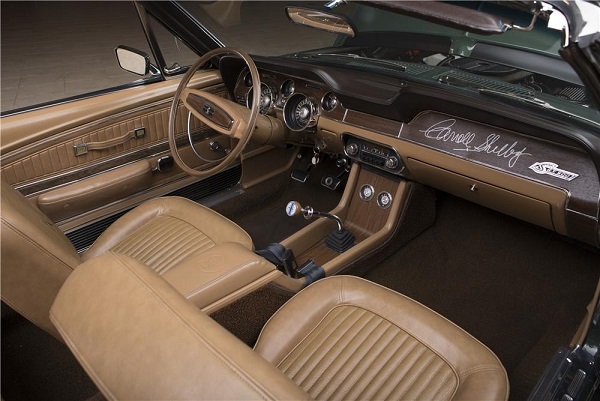 The 1968 Shelby Interior Décor Group (sometimes called "Deluxe Interior") includes: Woodgrain Dash applique, Deluxe door panels with simulated woodgrain, woodgrain door pulls, chrome buttons in seat backrests, bright pedal trim and a color coded automatic transmission shifter handle. Shelby changed the automatic transmission shifter handle on later cars. 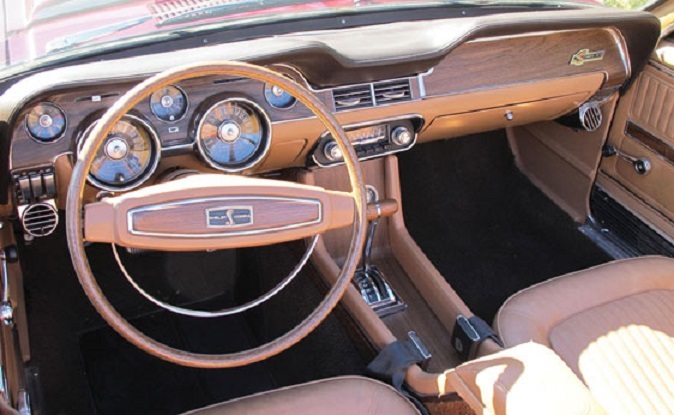 They also included the simulated, woodgrain steering wheel with a woodgrain center panel and a Shelby emblem. 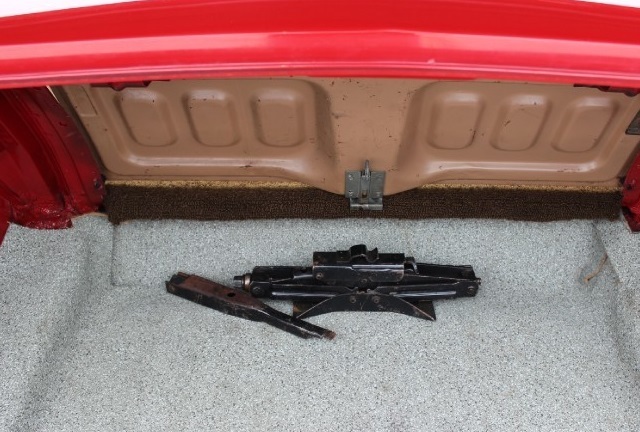 Painted metal surfaces are Medium Saddle in color and include: Dashboard / A- Pillars (includes headliner bracket), steering column, Interior door surfaces and the fold down seat trap door (both sides) for fastbacks. The dash pad is Dark Saddle Vinyl (Dark Brown) . The metal dash pad straps at the base of the windshield are Dark Saddle with texture. The carpet is Dark Saddle (Dark Brown). 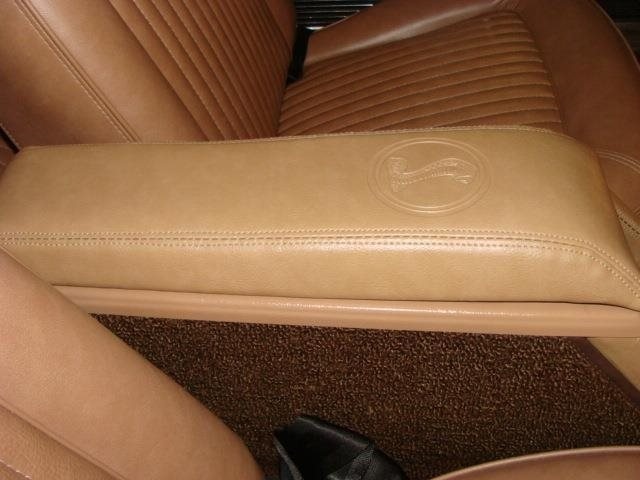 This includes the carpet on the side of the Shelby console which should match the floor carpeting. The seats are Medium Saddle vinyl. They have two chrome rectangular buttons in the backrests. 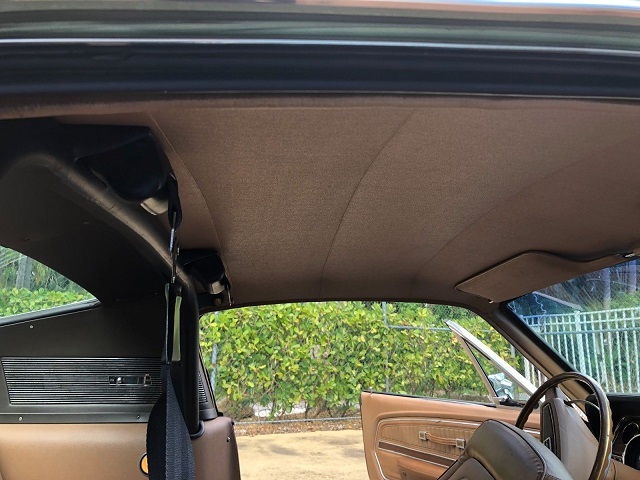 Soft Trim is Medium Saddle and includes: Door Panels / Arm Rests / Headliner / Steering Wheel Pad / Vinyl A-Pillars Pads (early) / Vinyl Lower Dash or Knee Pad (early) The deluxe, door pulls are Medium Saddle molded rubber. The sunvisors are Medium Saddle on a fastback and a convertible uses Dark Saddle. The windlace is Medium Saddle. The window crank knobs and are Medium Saddle molded rubber. The deluxe interior uses the shorter, window crank handle. 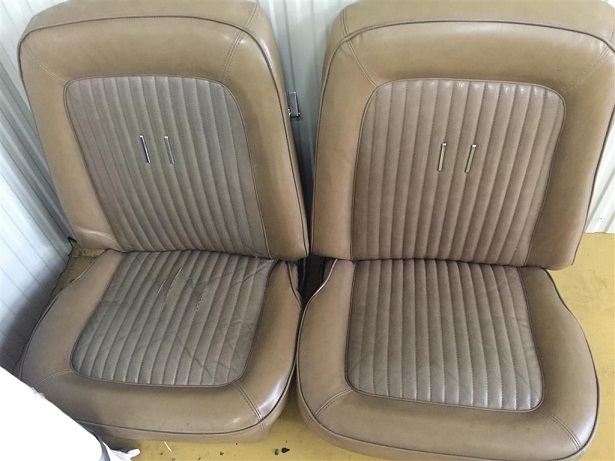 Rear Seat Area Interior panels (all cars) : Medium Saddle paint over fiberglass. 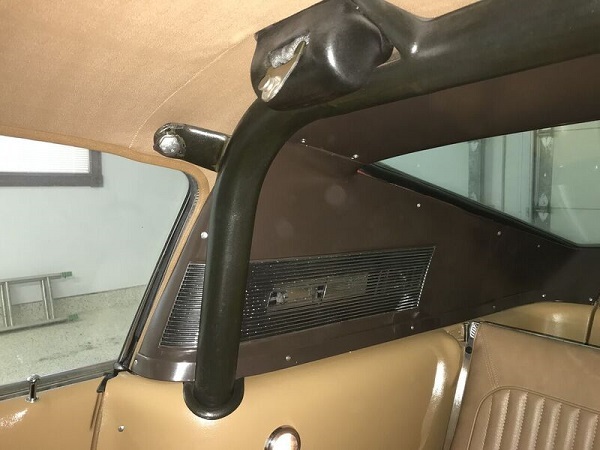 The upper panels on the fastback are Dark Saddle paint on fiberglass or metal. The strapping brackets are also Dark Saddle. The seat belts are always black on a Shelby. They are the 1968, deluxe metal style. The roll bar is always black on all 1968 Shelbys. The kick panels are Medium Saddle molded plastic. These have a tendancy to turn a pinkish color with age. You may also notice the turquoise paint on the column. Steering columns were pre-built and often showed up on the production line in other standard Mustang colors. 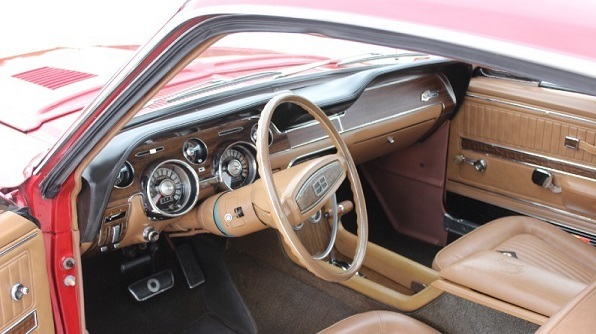 Since most of the 1968 tilt columns were used on Shelbys, the color was often changed to match the Shelby's interior. Other Variations: I have seen a few 1968 Shelbys that used a black steering wheel and black steering wheel pad in the saddle interior. This was most likely a supply substitution. There were several cars built with a non-deluxe steering wheel. These cars were built during a very specific time period of production. I have seen some early cars use a black automatic shifter handle. 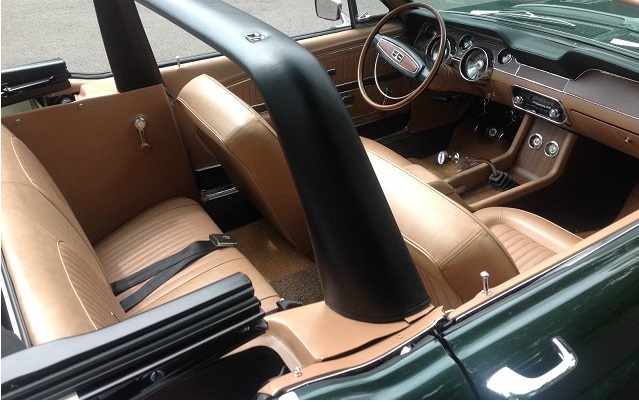 Ford did not have a “Comfortweave” Saddle interior for Mustangs or Shelbys during 1968. The fastback trap door is medium saddle on the back side with a semi-gloss black hinge.